Colour photograph of the Whitby Tourist Information Centre in Whitby. 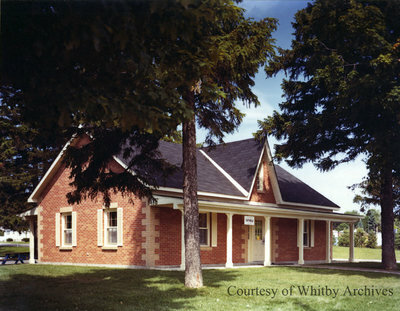 Formerly the Whitby Tourist Information Centre, this building now houses the offices of the Lynde House Museum, located at 900 Brock Street South, at Burns Street. Contractor - Winvalley Construction Ltd. - Whitby"
Whitby Tourist Information Centre, ca. 1983, photographer unknown. Whitby Archives photograph D2016_004_007.